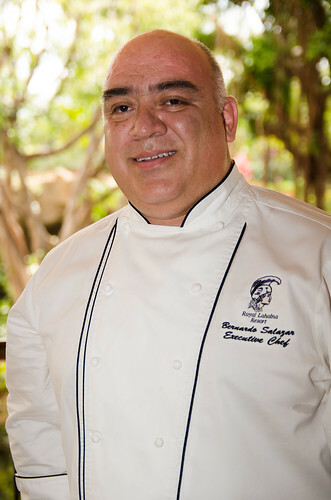 Chef Bernardo Salazar. Photo by Peter Liu. I have a good relationship with the local growers and producers and try to use their product whenever possible. Maui products are fresh and the quality is excellent. Some of the products I can get locally are fish, produce, dairy and liquors. All of our menu items utilize fresh ingredients, are prepared to order and are flavorful and light. I would say “Aina Kai” is our version of “Surf and Turf” with an island twist and the fresh fish enchiladas are the must order thing on the menu. I prepare my own seasoning–it’s almost salt-free, by using a combination of spices. I add more flavor by using cilantro, chilies, lemon zest, parsley, tomato juice or a strong stock to finish sauces and accompaniments. Place the tuna steaks in a very hot sauté pan and cook for only 1 minute on each side. Combine the olive oil, salt, pepper, lime zest, wasabi, lime juice, soy sauce and hot sauce. Add the avocados to the vinaigrette. Cut the tuna in chunks and place it in a large bowl. Add the scallions and red onion and mix well. Pour the vinaigrette mixture over the tuna and carefully mix.